Get your your youth group/small group/class/church talking. You'll be inspired, challenged, changed. Each story is open enough for you to enter in and to tell your own story or ask your own questions. Whether you want to discuss the details of the shorter story or explore the questions of the bigger pictures---well, that's your decision. - Publisher :Introducing the new Trigger DVD series conversations from Youth Specialties. 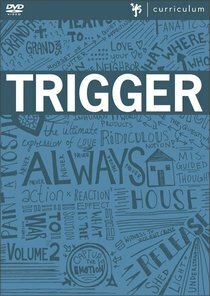 With video clips that hit on topics that matter to teenagers, and a pdf discussion guide to help you lead engaging conversations, you'll find Trigger is the perfect addition to your program for starting discussions or illustrating points in your messages.Whether you use Trigger in your large group, a small group, or even Sunday school, your students will connect and doors will be opened for conversations that matter.In Trigger Volume 2, you'll find five vignettes perfect for use in your youth group:? ?House? : As a father and son view some of the great religious structures of the world, this Trigger explores the question, ?what, where, and who is church ?Release? : This Trigger captures the emotion and mindset of a cutter to help shed light and understanding on a quiet epidemic affecting so many people.? ?Action x Reaction3 = Effect? : This short story follows the main character, who finds himself being interrogated about a violent crime he witnessed, opening up the question, ?What is the solution to war and violence ?Of Friends and Fanatics? : This Trigger paints a mosaic of the ultimate expression of love for mankind as viewers explore what it really means to love their neighbor.? ?In Whose Image?? : We are made in the image of our Creator. But we frequently forget whose image we're supposed to carry. About "Trigger Volume 2 (Dvd-rom)"
:Introducing the new Trigger DVD series conversations from Youth Specialties. With video clips that hit on topics that matter to teenagers, and a pdf discussion guide to help you lead engaging conversations, you'll find Trigger is the perfect addition to your program for starting discussions or illustrating points in your messages.Whether you use Trigger in your large group, a small group, or even Sunday school, your students will connect and doors will be opened for conversations that matter.In Trigger Volume 2, you'll find five vignettes perfect for use in your youth group:? ?House? : As a father and son view some of the great religious structures of the world, this Trigger explores the question, ?what, where, and who is church ?Release? : This Trigger captures the emotion and mindset of a cutter to help shed light and understanding on a quiet epidemic affecting so many people.? ?Action x Reaction3 = Effect? : This short story follows the main character, who finds himself being interrogated about a violent crime he witnessed, opening up the question, ?What is the solution to war and violence ?Of Friends and Fanatics? : This Trigger paints a mosaic of the ultimate expression of love for mankind as viewers explore what it really means to love their neighbor.? ?In Whose Image?? : We are made in the image of our Creator. But we frequently forget whose image we're supposed to carry.